兩岸三地 Liang An San Di: Xinhua: "World should know a true Tibet"
Having read a press release from Xinhua.net that encouraged the world to know about Tibet, how it was peacefully liberated by China in 1958, improved living standards for Tibetans, a good friend of mine, Dan, journalist by trade, decided to take up the Chinese Government's offer to know more about Tibet. CA (Chinese Embassy): Hello, Chinese Embassy. CA: I'm sorry Sir, I think the phone line isn't working very well; I heard you actually read an article on the Xinhua web site. Dan: That's right. In fact, I find the web site well done and very well informed. I learn a lot about China. It's a very positive and harmonious web site. CA: Hng? We're very glad to hear this. How can I help you? Dan: I've just read today's article about Tibet. 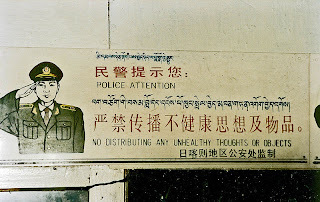 CA: What article about Tibet? 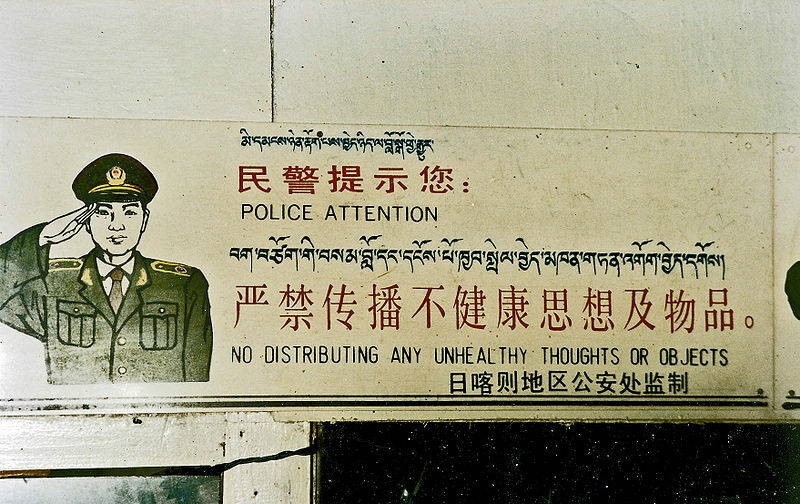 Dan: The one where it says that the World should know about a true Tibet. CA: I'm sorry, are you quoting from the article? Dan: Yes, I am. In fact, the article is quoting remarks from a Chinese scholar. CA: Oh! Could you tell me the URL of the web site. My apologies, Sir; you see, I'm so busy at work, I hardly have the time to read Chinese web sites. CA: I mean, we get a press review about all the foreign newspapers, and I have to spend half a day reading them everyday. China has become so popular. So the address is ... yes … yes … Thank you. How may I help you? Dan: Yes, I would like to go and visit the true Tibet. CA: Certainly, a lot of foreigners go to Lhassa these days; it's a very harmonious place. Dan: Well, in fact, I'd be more interested to go to small villages. I really like the idea of discovering and learning about a true Tibet and its small cities or villages. Something as in the movie Mountain Patrol, Kekexili. CA: Mountain Patrol? You mean, you've seen the movie and you like it. I haven't got the chance to see it myself. CA: We really strive to establish a true and harmonious understanding between Tibetans and other Chinese. Ah! I got it, I can read the article. Mr Hao of the Chinese Academy of Social Sciences said this when he was in Chile. Dan: Yes this is the article. Maybe he wanted to learn about the Chilean miners and how they were rescued and use the experience to do the same in China. In fact the article doesn't say much about the visit. CA: OK, so, you want to apply for a visa. We can issue you with a visa to go to Lhassa, but I'm afraid it won't be possible to issue you a visa for places outside Lhasa. Dan: But your Secretary-General said we should learn about the true Tibet. CA: Of course, this is why we're only issuing visas for Lhasa. I'm not sure you're listening. Dan: Thank you, I've learned everything I wanted to know about the true Tibet.